In this tutorial I used a M-11/NINE, the general procedure should be similar for all M-11s. Field stripping your M-11 is very easy. The only tools you will need is your hands and a small screw driver. MAKE SURE YOUR GUN IS UNLOADED BEFORE DOING THIS!!!!! First deploy the collapsible stock until it locks into the open position. This will get it out of the way if you wish to disassemble the internals any further. 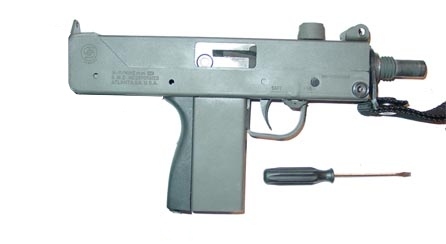 NOTE: The M-11/NINE pictured has the stock removed. Now take a screwdriver, a bullet tip, or a wooden dowel (I prefer a pointed dowel so I don't scratch anything) and find the take down pin on your M-11. It is located at the front of the gun on the lower. 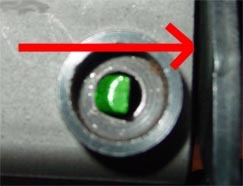 Notice how one side of the take down pin looks like what is pictured to the right? 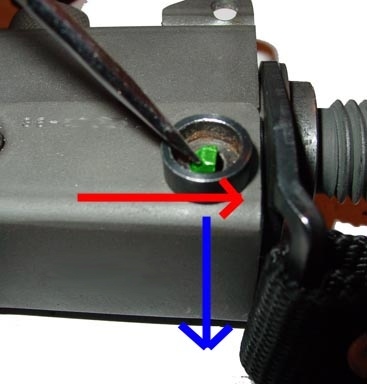 What you want to do is take your dowel or tool and push the “latch pin”, marked in green on the photo, and push it towards the center (red arrow). What this does is unlock the pin so it can come completely out. 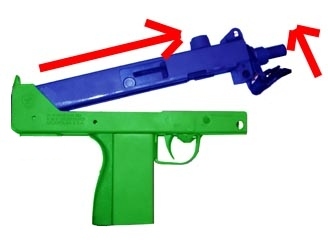 While pushing the “latch pin”, marked in green, towards the center (red arrow), push it down (blue arrow) at the same time and use your tool to push the pin down through the hole and then take it out from the other side of the gun. 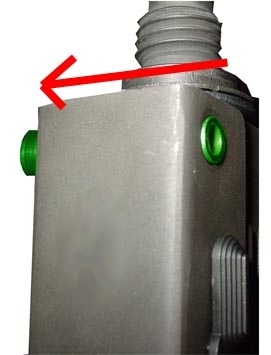 With the “latch pin” removed you can push the take down pin “housing”, marked in green, out of the receiver. The “housing” only comes out in one direction so it is pretty straightforward. 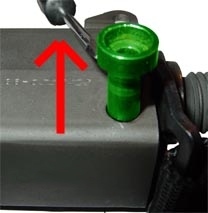 Try a "twist and pull" approach first, but if the “housing”, marked in green, is to hard to remove by hand, you can carefully lever it up with the end of a screwdriver. Just be sure not to scratch up the receiver when doing this. 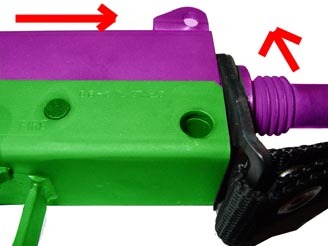 Once the take down pin is removed you can separate the upper receiver, marked in purple, from the lower receiver, marked in green. To do this grab onto the upper receiver and pull it forward and up (red arrows). 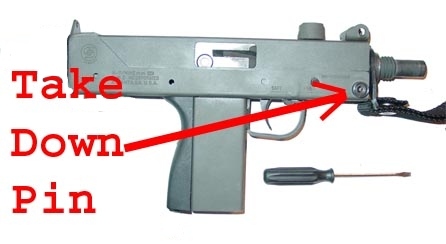 The upper receiver must clear the rear section of the lower receiver for it to separate. You may have to pull it a bit forward before it will allow you to pull up. Pulling and holding the trigger may help also.